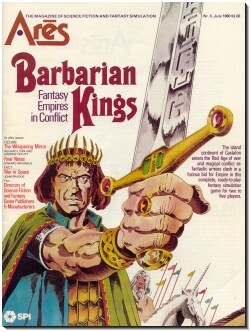 Issue #3 of Ares appeared in July 1980. It begins with an editorial by Redmond Simonsen, in which he praises the recently-released film, The Empire Strikes Back, about which more will said later in the issue. Personally, I find this interesting because it puts this issue in immediate historical context. I would have been preparing to enter the sixth grade at the time and had been playing RPGs -- D&D primarily -- for less than a year. I hadn't even started reading Dragon yet. As in the previous two issues, this one includes not one but two pieces of fiction. The first, "The Whispering Mirror," is a fantasy tale by Richard Lyon and Andrew Offutt. The second, "Final Notes," is, for lack of a better word, a "weird tale" by Michael Edwards. Neither is particularly noteworthy in itself, but, as I've remarked before, it's fascinating that Ares devoted so much of its brief (40) page count to fiction. "Space Wars" by John Prados is another "real science" science fiction article, this time devoted to space-based weaponry. Though the article retains some of the fun-deflating concern with realism of its predecessors, it does so more matter of factly, without the glee that seemed to animate the others. Also, the article evinces concern in multiple places about the real world dangers to peace and humanity's very survival if space becomes militarized. In historical context, it makes more sense, but I can't deny that it strikes an odd tone in a magazine published a wargaming company. Issue #3's integral wargame is called "Barbarian Kings" and was designed by Greg Costikyan and Redmond Simonsen. The game, for two to five players, is "a simulation of the Red Age of political and military turmoil on the island continent of Castafon situated in the northern quadrant of the Fira Ocean on the planet Hypastia." That description, right there, nicely encapsulates so much of what I feel about SPI's fantasy efforts -- bold yet tone deaf. Each player assumes the role of a "provincial king" hoping to use his power and influence to bring enough provinces under his control to achieve victory. The game includes human troops, as well as orcs, elves, and dwarves (as well as "whale folk" and "war frogs"). Magic exists and works mostly on a "high" level, which is to say it's mostly strategic, aiding or impeding actions on the map of the world. Combat, movement, and resource management are all fairly simple and straightforward, even to a guy like me who's far from a wargamer. Eric Goldberg presents reviews of numerous games in his signature snarky style. His first review is dedicated to Steve Jackson's In the Labyrinth, which he calls "as good as any FRP system currently available commercially." Of the second edition of RuneQuest, he is more critical, seeing it as simultaneously a step forward from D&D (and its "odious" level-based system) but also unnecessarily complex in other places and with systems that "don't mesh together as nicely as one would hope." He also criticizes its price and its cover artwork, which he says depicts "a somnolent girl dressed for a Marquis de Sade Costume Ball proffering an oversized tortilla to a ravenous, deformed gila monster." His brief review of Tunnels & Trolls largely dismisses it as a "puff-piece." He concludes by reviewing all three volumes of AD&D, the Dungeon Masters Guide having been out less than a year by this point. Goldberg is mostly negative about AD&D, saying that, rather than correcting the "previous rules maladies" of OD&D, AD&D made the situation much worse. He instead recommends that, "if the reader is interested in investing in D&D as the most prevalent FRP game, bu the collector's edition and Greyhawk, and ignore the rest." Concluding the issue are brief book reviews, along with reviews of several movies, including The Empire Strikes Back, to which Simonsen referred in his opening editorial. The reviewer praises the film for taking Star Wars in new directions and for its "grimness." Reading through the review, it almost seems as if the writer actually disliked Star Wars for having "the tension ... of an Erroll Flynn film" and being "light" -- precisely the qualities that made the original such a huge hit in the first place. But then it wouldn't be an Ares magazine review if it didn't pour on the macho posturing. Had SPI published DragonQuest by this time? It makes you wonder how much of that dissing of the flagship FRPs of the early 80s could be chalked up to that. DQ came out in June 1980, shortly before this issue released. That cover really reminds me of my old DQ boxed set. I gave it up in a round of eBay selling several years back. Why I ever sold old games to buy new ones is beyond me. Whale folk *and* war frogs? Sign me up! The addition of a planet to "Barbarian Kings," which would have to be no more than 5 pages of rules seems to underscore your critique. Political and military turmoil in the northern region of a small continent would obviously suffice. Totally tone deaf: too much scope for the action. In other words, space strategy structure with a fantasy overlay. Confusing. "[B]uy the collector's edition [of D&D] and Greyhawk, and ignore the rest." In terms of Gygaxian D&D, I think the above is the best version. "But then it wouldn't be an Ares magazine review if it didn't pour on the macho posturing."